The last date to apply online for SSC CHSL 2017 is 18-December-2017. Aspirants online who haven't fill SSC CHSL application form yet, this is the last chance for online registration. The application form is available at the official website (ssconline.nic.in), or visit direct registration link given below. In order to fill the SSC CHSL online form for LDC DEO 10+2 Exam, you should know what are the details needed to fill in the application form, so that you could make available all the documents, details of which you need to mention in the form. Therefore, check out the step by step guide on how to apply online for SSC CHSL 2017. There is a major change in SSC CHSL Exam Pattern 2017 Tier I which is the reduction of time duration from 75 to 60 minutes. 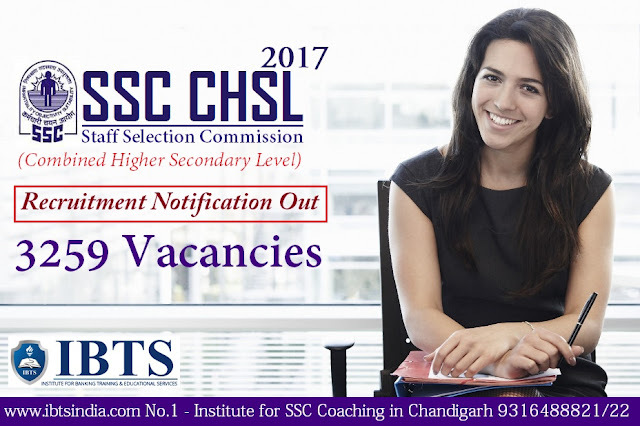 Consider as the most desired organizations to work with, SSC has lately released the recruitment notification of CHSL 2017 exam to fill the vacancies in various Ministries/Departments/Organizations of Government of India for the posts of Postal Assistants/Sorting Assistants, DEO), LDC, JSA & Court Clerk. SSC CHSL Tier 1 exam 2017 will take place from 04.03.2018 to 26.03.2018 in various shifts. The number of tentative vacancies for SSC CHSL 2017 is 3259. The minimum age to apply for SSC CHSL exam is 18 years and the maximum age is 27 years (as on 1st August 2018). Candidate please note that only online applications will be accepted at http://ssconline.nic.in. Women candidates and candidates belonging to Scheduled Caste, Scheduled Tribe, Physically Handicapped, and Ex-Servicemen (eligible for reservation) are exempted from paying application fee as per extant Government Orders. Examination will be held in a computer based pattern. There will be negative marking of 0.50 marks for each wrong answer in Paper-I. SSC has changed SSC CHSL 2017 Exam pattern: Time duration of SSC CHSL Tier I is reduced from 75 minutes to 60 minutes.